The FTC has approved the final consent order settling charges that L’Occitane, Inc. deceptively claimed that two of skin creams have body slimming capabilities and are clinically proven. 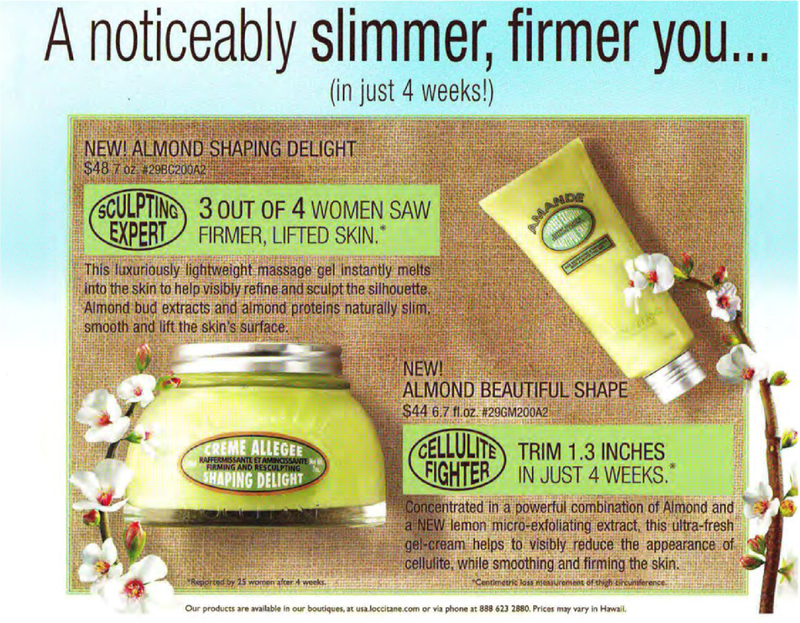 The settlement requires L’Occitane to pay $450,000 for consumer redress, as well as prohibiting it from making future false and deceptive weight-loss claims. Sunscreen products now may be labeled with new information stating that they reduce the risk of skin cancer and early skin aging, as well as help prevent sunburn, , when used with other sun protection measures, under a new FDA regulation effective June 14, 2011. Products that pass the FDA’s test for protection against both UVA and UVB rays now may be labeled as “Broad Spectrum.” Under the new labeling, sunscreens labeled as both Broad Spectrum and SPF 15 (or higher), if used regularly, as directed, and in combination with other sun protection measures will help prevent sunburn, reduce the risk of skin cancer, and reduce the risk of early skin aging. However, products that have SPF values between 2 and 14, while they may be labeled as Broad Spectrum if they pass the required test, cannot state that they reduce the risk of skin cancer and early skin aging, when used as directed. Only products labeled Broad Spectrum and with SPF values of 15 or higher may make that statement. The new regulations will become effective for most manufacturers in one year. Manufacturers with annual sales less than $25,000 have two years to comply. Broad Spectrum designation. Sunscreens that pass FDA’s broad spectrum test procedure, which measures a product’s UVA protection relative to its UVB protection, may be labeled as “Broad Spectrum SPF [value]” on the front label. “Waterproof, “sweatproof” or “sunblock” claims. Manufacturers cannot label sunscreens as “waterproof” or “sweatproof,” or identify their products as “sunblocks,” because these claims overstate their effectiveness. Sunscreens also cannot claim to provide sun protection for more than 2 hours without reapplication or to provide protection immediately after application (for example– “instant protection”) without submitting data to support these claims and obtaining FDA approval. In addition to the final rule for sunscreen labeling, the FDA released three additional regulatory documents — a Proposed Rule, an Advance Notice of Proposed Rulemaking (ANPR) for Dosage Forms, and a Draft Enforcement Guidance for Industry. The proposed rule would limit the maximum SPF value on sunscreen labels to “50 +”, because, FDA says, there is not sufficient data to show that products with SPF values higher than 50 provide greater protection for users than products with SPF values of 50. The ANPR will allow the public a period of time to submit requested data addressing the effectiveness and the safety of sunscreen sprays and to comment on possible directions and warnings for sprays that the FDA may pursue in the future, among other issues regarding dosage forms for sunscreens. The Draft Enforcement Guidance for Industry outlines information to help sunscreen product manufacturers understand how to label and test their products in light of the new final rule and other regulatory initiatives.